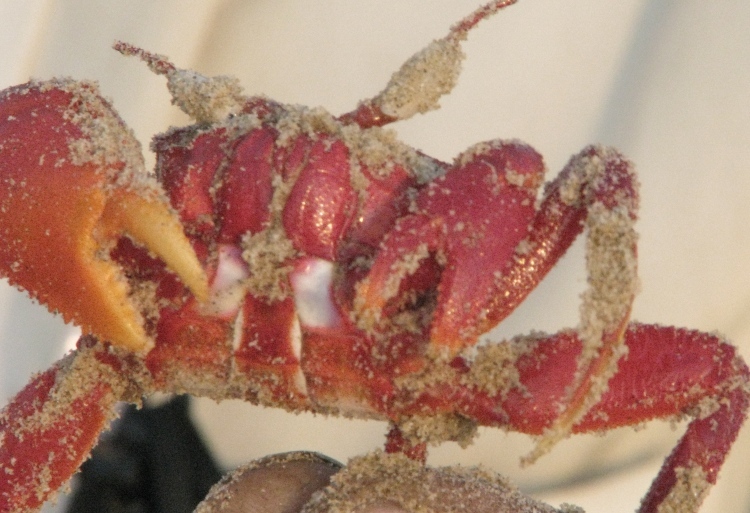 Thousands of small red crabs crawling on Mandarmani beach. In the month of January of the year 2005 when I visited Mandarmoni Beach for the first time, it was nothing but a desert and was known as Dadan Patra Bar. There were two fish procurement areas locally known as "Khoti" and one small building that erstwhile was a temporary residence of the owner who engaged here for prawn production. This building was later converted to a small hotel like holiday home of 7/8 pacca and temporary rooms. There was no metal road at all to reach the beach. Rather you can say no proper roads were there. It was next to impossible to ply cars on the roads. Land was available at throw away price. But I loved the beach at first sight and on the 24th of February, 2005 I purchased a few acres of land for my project: The Sana Beach. I started construction bearing huge problems and started advertising Mandarmoni as a new tourist destination. From 2006 onward many people expressed interest to purchase land for investment as well as to start new hotel projects. Now Mandarmoni Beach is not a single village anymore. Various villages like Silampore, Sonamui, Dadan Patrabar are parts of Mandarmoni Beach in addition to Mandarmoni village itself. Hundreds of landless and small land holders got regular jobs. The villagers sold part of their lands at high prices and some of the villagers started their own business connected directly or indirectly with the tourism industry. The socio-economy changed rapidly. Now the price of land is not less than 30 times in comparison with 2005. 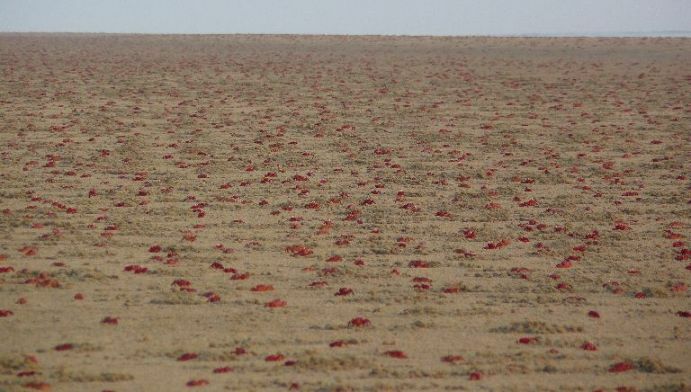 Day by day thousands of red crabs are disappearing due to heavy traffic movement. I feel this should be regulated till the back side road starts working. 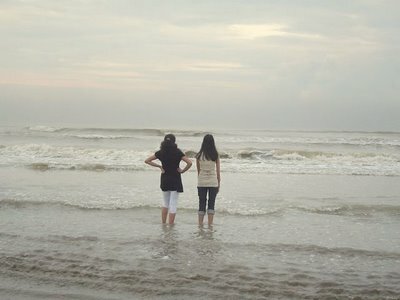 This area (Mandarmoni to Purusottampur) has already been designated as "Beach Circuit Tourism" zone by the Tourism Dept. of the Govt. of India. Nowadays, there is a good metal road leading to the beach. Back side road work has been started by the Panchayet . The land for the road was donated by the villagers and hoteliers. More than 50 hotels including a few resorts are operating. Another 10/15 are coming up. We have a strong association called Mandarmoni Beach Hoteliers' Welfare Association that is always engaged for the betterment of the area. While reaching Mandarmani, by mistake we took the newly built kaccha road which lies behind the hotels. The condition of that road is not at all good and it is so narrow that crossing of even two cars simultaneousy was very difficult. The first gear of my car was not working properly and on enquiry we came to know that getting a mechanic is almost impossible at Mandarmani and that one has to be brought from Kanthi, almost 50 km away from there. Luckily the next day I fixed the problem, otherwise we could not have come back through the normal beach road as one needs to drive up to a very steep height to reach the main road from the sea beach. The sun rises in Mandarmani beach. Photograph: Arnie Ray. 2009. 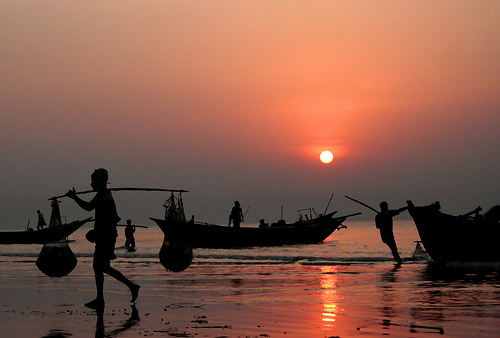 Mandarmani beach, India, Photograph: Anonymous. Mandarmani visitors enjoy a walk on the beach. This red crab was hanging around near Mohana in Mandarmani. 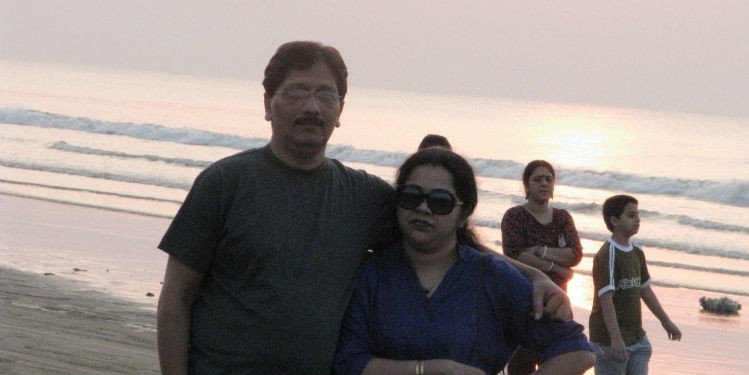 "Mandarmani is very expensive, but far better than Digha & Bakkhali. It is a very calm & quiet tourist place, specially in the week days. The road from Chaulkhola to Mandarmani is now good. There are still no electrical power supply lines." Please use the following links to get more information on Mandarmani. 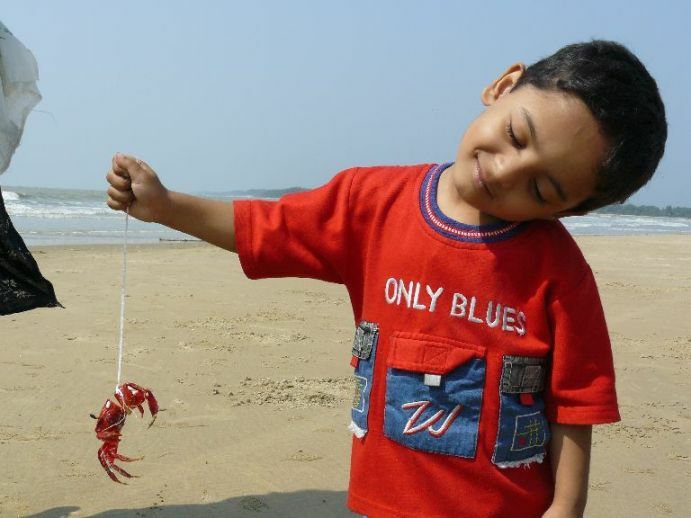 I am having a crab of a time at Mandarmani.